Prep time: 10 minutes Cook Time: 30 minutes Janie’s inspiration came from her mom’s co-worker, whose husband was a Season 15 contestant on The Biggest Loser. The co-worker would bring in a delicious turkey chili that Julie would rave about at home. Janie asked her mom’s friend if she could have the recipe and then, like a true little chef, added some things to make it her own. Brown the ground turkey and sliced turkey kielbasa in a pan over medium heat. Cut up the yellow squash and zucchini. In a separate pot, place the yellow squash, green zucchini, petite diced tomatoes, tomato sauce, dark kidney beans, and light kidney beans. Add the packet of taco seasoning and the browned meat and mix together. Let simmer for approximately 20 minutes, remove from heat then add spinach. 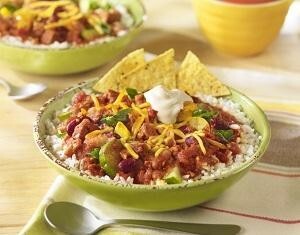 When rice is done, place a scoop of rice in each bowl, top with turkey chili, garnish with shredded cheese, sour cream and a few tortilla chips.